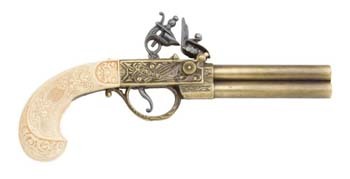 English Flintlock Blunderbuss Pistol: Replica English Flintlock Blunderbuss Pistol 18th century. Length: 10.3” overall. Deluxe Flintlock BLunderbuss - Replica Deluxe Flintlock Blunderbuss: Circa 18th Century. A great highway/boarding piece. Simulated wood stock. Features Length: 19”, Weight: 3 lbs.